↑ "Actor Jason Isaacs Joins Larry King on PoliticKING". Larry King. 14 May 2015. 03:44. สืบค้นเมื่อ 15 August 2016. We got married in the end, my wife and I, for insurance purposes. ↑ "Spark of Rebellion". Star Wars Rebels. Disney Channel. 3 October 2014. Event occurs at 43:07. ↑ "Napoleon: Total War – Story Trailer". TotalWar.com. Archived from the original on 6 April 2012. 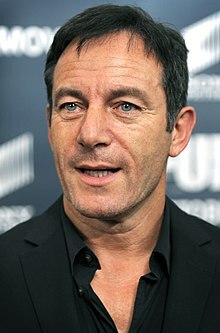 "Jason Isaacs Biography". Yahoo! Movies UK & Ireland. Archived from the original on 25 August 2007. สืบค้นเมื่อ 24 June 2008. หน้านี้แก้ไขล่าสุดเมื่อวันที่ 13 ธันวาคม 2560 เวลา 10:26 น.